We look forward to the opportunity to learn more about your needs. Note: This Form Accepts Common Image (GIF, JPG, PNG), Document (PDF, Word, Excel), Archive (ZIP and Rar), Autocad, Solidworks, Creo, Step, IGES, Catia, and JT Open files. If the file you wish to submit is not on the list, is too large to upload, or is a package of drawings (and you don't know how to Zip them) please submit the RFQ without an attachment and our Sales department will get in touch with you and work with you. Please also note some employers run data-loss prevention software on company computers to prevent data breaches and exfilatration of proprietary data that may result in this form returning an error. If you believe this to be the case, please give our sales department a call and we will be more than happy to work with you and your organization to get a quote out to you. Thank you. 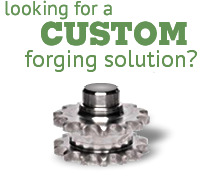 We provide customized forging solutions to our customers, not just commodities. Partner with us and see how our in-house design and engineering expertise delivers real value to you!